Photo Credit: WFSEc28-. Licensed CC-BY-ND. After months of discussion, the movement to raise the minimum wage to $15 an hour in Seattle takes another step forward this weekend. While Mayor Ed Murray’s Income Equality Committee continues to haggle about a proposal to be presented to the City Council, 15Now, the primary organization behind raising the minimum wage is holding the 1st 15Now National Conference tomorrow (April 26) at Franklin High. The Conference also signals the kickoff of a grassroots signature campaign. On Apr. 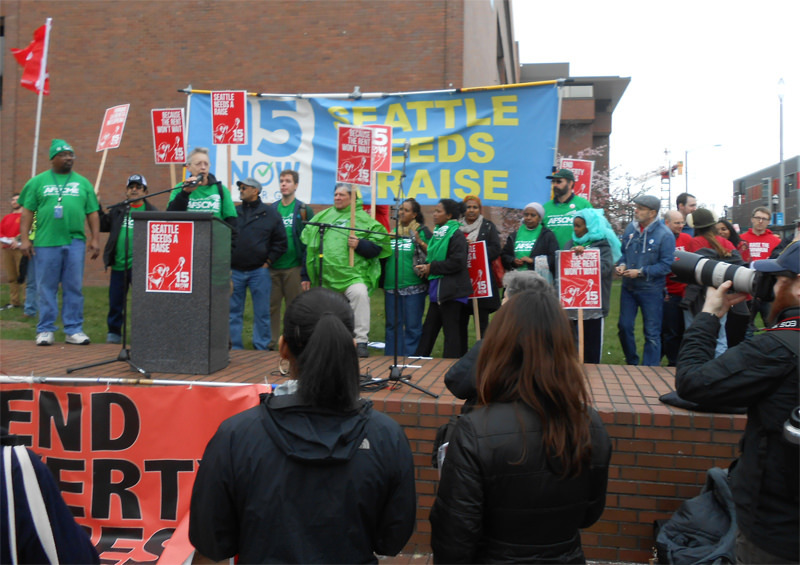 14, activist groups including 15Now and Socialist Alternative, filed a Seattle city charter amendment to raise the minimum wage to $15 from $9.32 an hour starting Jan. 1, 2015. 15Now hopes to collect 50,000 signatures as 30,000 are needed to get the initiative on the ballot. The measure calls for a three-year “phase in” for small business and non-profit organizations to reach $15. In the amendment, small businesses are defined as 250 or fewer full-time employees. Major chains like Starbucks, McDonald’s, Walmarts etc. would have to be implement the new wage on Jan. 1. Apparently that’s one of the sticking points on the Mayor’s commission as some members want a “phase in” for all businesses. Council member Kshama Sawant spearheaded the drive for a higher minimum wage when she first ran for the council last year (and both mayoral candidates – Murray and former mayor Mike McGinn both jumped on the bandwagon when it became apparent that issue resonated with the public). When Murray was unable to make his recommendation to the Council on Thursday, Sawant called the committee a failure. “The committee had divergent goals,” said Sawant, who served on the committee with pro-15 allies like Service Employees International Union 775’s David Rolf along with people from the business community like Howard S. Wright from the Seattle Hospitality Group and the Space Needle. Sawant wasn’t the first City Council candidate to argue for a massive raise in the minimum wage. In 2005, Linda Averill of the Freedom Socialist Party advanced the idea of a $17 minimum. Speculation on a livable wage for Seattle ranges from $16 to $21 an hour. According to City Council member Nick Licata, who was also a member of Murray’s commission, the median rent for Seattle is now $1600 a month. That’s an increase of 6% from last year, the largest increase in the country. Forbes says the current cost of living in the city is 22% above the national average. McGrath’s a member of the District 2-Columbia City 15Now group. At a February rally, activists were encouraged to hook up and work with others in their Council District. Another group, OneSeattle Coalition, could also file an amendment for next fall’s elections. The Coalition’s web-site said it’s funded by the Washington Restaurant Association, the Washington Logging Association, and has the support of the Seattle Chamber of Commerce. The group supports a minimum wage if it’s phased in over several years and based on total compensation, which deducts employee benefits such as health care and retirement from the $15. Waitress tips are also deducted. In Oklahoma, waitresses can be paid as little as $2 an hour because they receive tips. At the 15Now National Conference doors open at 9:30 and workshops and speakers are scheduled throughout the day. Along with Sawant, speakers include David “Goldy” Goldstein, formerly with The Stranger and longtime blogger at HorsesAss.org, Pulitzer Prize-winning reporter David Cay Johnston, author of the book Perfectly Legal: The Covert Campaign To Rig Our Tax System To Benefit The Super Rich–And Cheat Everyone Else, and Glen Ford of Black Agenda Report and Black Agenda Radio, on the Pacific Radio Network.